A smart shoe with a style difference. Not all shoes were made the same. This pair by John White has a simple strip of brogue detailing to bring a hint of pattern without upsetting the sleek look of the shoe. It’s a subtle difference, but it won’t go unnoticed. Wear them time and time again thanks to their leather make up that will stave off bad weather and fit your feet perfectly. 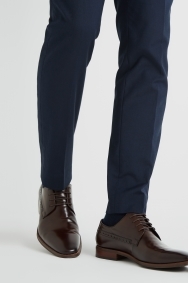 The dark brown colour will match almost all suits, from blue to grey and black. 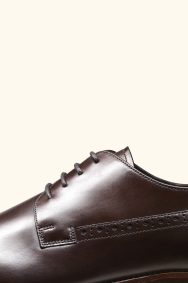 They’ll look especially good under a windowpane checked suit to match the classic style of the Derby shoe. These shoes are amazing! A great recommendation from your staff. Its too early to tell how well these shoes will 'wear' and their durability. 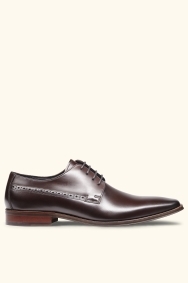 A very comfortable pair of shoes, well matched to the suit. 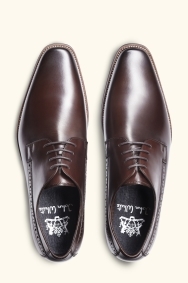 Excellent formal shoes! The design and quality is great. They will go with most suits.